Since about last weekend, Emmie has been sleeping terribly. Cranky all evening, and waking often at night, not even always to feed. One night, I was lucky to get 40 minutes of sleep at a time. I know we are very, very lucky that this is highly unusual, but it still was rough. I chalked it up to a possible growth spurt and also to weaning from the swaddle. Our pediatrician had recommended weaning from the swaddle at our 4 month appointment, but it just didn’t feel right. When we left even an arm out, she cried, fussed and continually pulled out her Soothie, which would wake her again. She wasn’t skilled enough to be able to get it back in consistently, so we would have to run in and do it. When we DID swaddle her, she literally fell asleep within a minute or two. You could see her physically calm and relax. How could we give that up? Well, sometime last week, she started doing something that signaled to me that she was ready. I wish to heaven I could remember exactly what made me think that, but we can just chalk it up to “parenting instinct.” I left one arm out that nap, no problem. The next 3 naps were great (night time was still hit or miss). Eventually, we could leave both arms out, hooray! But night was still awful (see above). Then yesterday, I reverted back to my old strategy, from before Emmie had anything resembling a schedule. I put her to sleep when she acted tired. Yep, I’m a genius. So first nap was 30 minutes earlier than normal. She woke after about an hour, ate, got changed and while she was on the changing table, started acting tired again. Hmm… ok, bed then! I put her right back and she slept another HOUR AND A HALF. 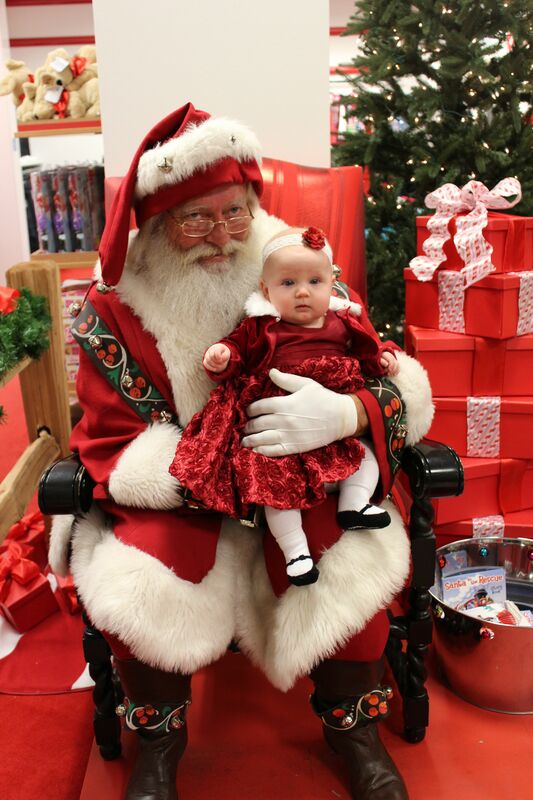 She was barely awake 5 minutes before the sitter came at noon. Crazy! She then apparently took another nap, then went down again at five thirty. AND DIDN’T WAKE UP UNTIL 6:30 THIS MORNING (except for one brief feeding around nine, when we also changed her diaper against her will because she wasn’t even in her night time diaper yet!). Do I think this will happen every night? No way (but I still hope!). But I do think she was trying to tell us something with the fussy evenings and waking often at night. She was trying to say “I’M TIRED, YOU MORONS!” Poor baby! Oh well, at least we eventually picked up on it, even if we were a little slow on the uptake! “I guess this isn’t so terrible.” (Proceeds to reach up behind her and stroke his beard. I am not joking). (Not pictured) Emmie LOSING it while being lifted off his lap. Hilarious. 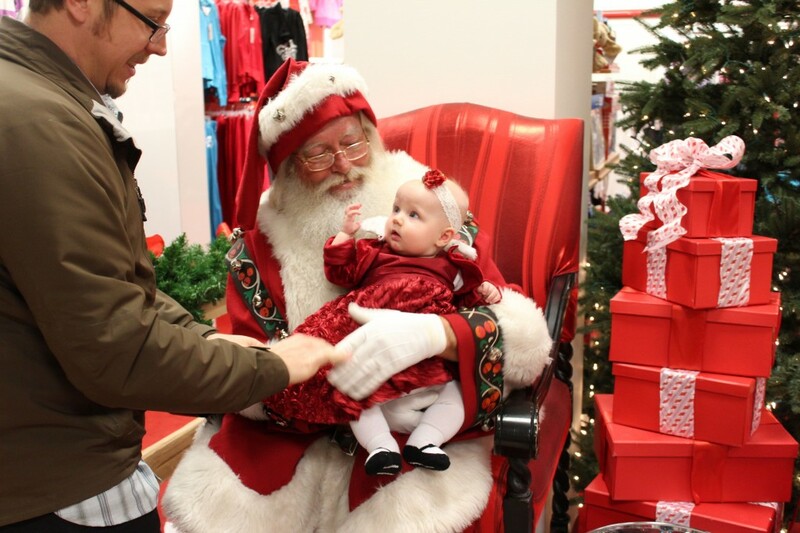 Also not pictured, every other parent in line commenting on her cuteness and store employees coming over to see how adorable she was (this was a free Santa in the basement of a slow Macy’s, so none of the other kids were remotely dressed up, plus she IS the cutest thing ever, IMHO). Jess, I definitely have read about sleep regressions, and I still am not convinced that that's what this was (partly because we already lived through the 4 month one, haha), but also because I think she was sleeping poorly because we were misreading her cues that she wanted to sleep earlier (thus, the early evening crankiness). When we relented and didn't think "bedtime=7 PM," but rather, "bedtime=whiny time," that's when everything got better. But I agree, knowing about predictable sleep regressions is HUGE! Definitely has helped me get through all of them up until now!